Customers eager to get their hands on Sony's new PlayStation 3 mobbed Tokyo electronics stores in a buying frenzy on Saturday morning as the game console went on sale in Japan. Numbered tickets were handed out to some 1,850 people lined up outside the Yodobashi Multimedia Akiba electronics megastore in Tokyo's Akihabara district before sales commenced at 7 a.m.
After a countdown ceremony, Shigeo Maruyama, the former chairman of Sony Computer Entertainment (SCE), handed over a PlayStaton 3 console to 25-year-old Akihiro Okawa, the first person in line. "I thought that Yodobashi Multimedia Akiba would have them in stock. There were so many people I thought I wouldn't be able to buy one, so I'm really happy," said Okawa, who said he had waited outside the store since about 10 p.m. the previous evening. "I bought 'Mobile Suit Gundam -- Target in Sight.' I'm also looking forward to games like 'Gran Turismo HD' and 'Metal Gear Solid 4,'" he said. SCE President Ken Kutaragi turned up in Akihabara early on Saturday and apologized that only a limited number of the game consoles were available for sale on opening day. "I'm happy that this day has arrived, but I feel sorry toward the stores that we only have a small number (of the consoles). We want to sort things out somehow by December," he said. Another Akihabara store, Laox Asobit City stopped handing out tickets at about 11:30 p.m. on Friday when the queue reached 230 people. Before sales commenced at 7 a.m., Sega handed out free Blu-ray high-definition DVDs featuring video clips from the titles "Enchant Arm" and "Armored Core 4." 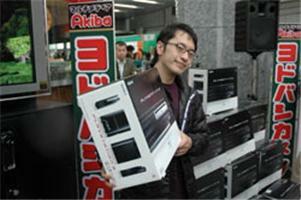 Below: Akihiro Okawa, the first person to buy the PlayStation 3 at Yodobashi Multimedia Akiba shows off his new console.